1964: Can the Kid Do It? Wings Think So! When Toronto GM Punch Imlach called Terry Sawchuk’s name at last June’s NHL intra-league draft, little Roger Crozier’s life changed forever. 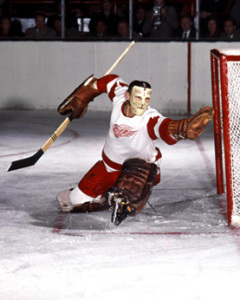 Sawchuk, you see, was the veteran all-star netminder who had held down the Detroit Red Wings goaltending duties since the 1957-58 season. Terry Sawchuk will be wearing the blue and white of Toronto this season. Crozier, a 22-year-old native of Bracebridge, Ontario, with an affinity for carpentry suddenly found himself holding one of only six goaltending jobs in the best league in the world. As if this weren’t enough pressure to put on the youngster, the Red Wings missed the Stanley Cup playoffs last season and expect their new netminder to lead them back to the post season. If all that thinking about the pressure of being the top goaler for the Wings is playing on Crozier’s mind, he’s shown absolutely no sign of it through the first few exhibition games. In his first three pre-season matches against the Stanley Cup champs, Toronto has managed only a tie against the diminutive Crozier. 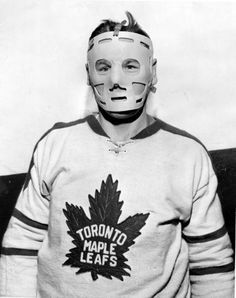 In the third game against the Leafs, played in Kitchener, the fog was so thick both Crozier and Leafs’ Johnny Bower donned masks, figuring the protective gear couldn’t impair their vision any more than the misty haze that lingered over the ice surface for most of the game. Watching such a savvy performance under such conditions, Sid Abel, Detroit GM, feels the Red Wings are in more than capable hands with Crozier between the pipes. A rare photo of Johnny Bower wearing a mask. The 5 ft. 8 in. Crozier began as a goaltender at age six in Bracebridge and was a standout around his home town almost immediately. By fourteen, he was playing Intermediate hockey and winning championships at that level. This led to his signing a C form with the Chicago Black Hawks. 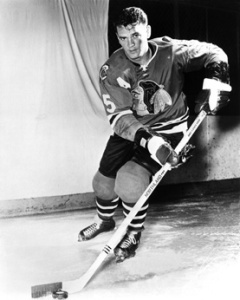 Becoming Hawks’ property meant he would be playing for the Junior A TeePees in St. Catharines in 1959. For the next three seasons, Crozier had a stellar Junior A career, being named an all-star three times, along with winning the 1960 Memorial Cup Championship, emblematic of Canadian junior hockey supremacy. Roger turned pro in 1962 when he joined the St. Louis Braves of the Eastern Professional Hockey League, Chicago’s lower minor league farm club. In June of 1963, the Black Hawks decided they needed a bit more of an edge on their team and traded Crozier to the Detroit Red Wings, along with defenseman Ron Ingram in exchange for Puck’s Bad Boy, Howie Young. The Hawks felt that Crozier was expendable because they had Glenn Hall, the most dependable goaltender in NHL history manning their net on a nightly basis. Young meanwhile, was a flop in Chicago and is no longer in the NHL. After spending last year at Pittsburgh in the American Hockey League, including a 15-game stint with the big club when Sawchuk was injured, the Red Wings decided that Roger’s time is now. Howie Young – he cost the Black Hawks Roger Crozier. Can such an unorthodox style be successful? Crozier’s style is described as acrobatic, flamboyant, even frenetic. He definitely does not fit the traditional goaltending mold today’s NHL coaches love. He is down more than up, and it appears he will do virtually anything to get some part of his anatomy in front of a puck. Unorthodox would be an understatement in describing his methods. However, such an esteemed observer as the Toronto Star’s Red Burnett thinks the slightly built puckstopper is ready for the big time. “He makes the big save with the competence of a veteran and moves with the speed of a rattlesnake.” The only concern expressed by scouts about Crozier is his rather smallish frame. One wonders if he will be able to withstand the rigors of the 70-game NHL grind. If Roger is up to that, we could yet be seeing a return by the Red Wings to the NHL’s upper echelon.